The centenary of the birth of Irma Stern provides an excellent excuse to exhibit the work of former South African artist Albert Adams – an expressionist of a different kind. 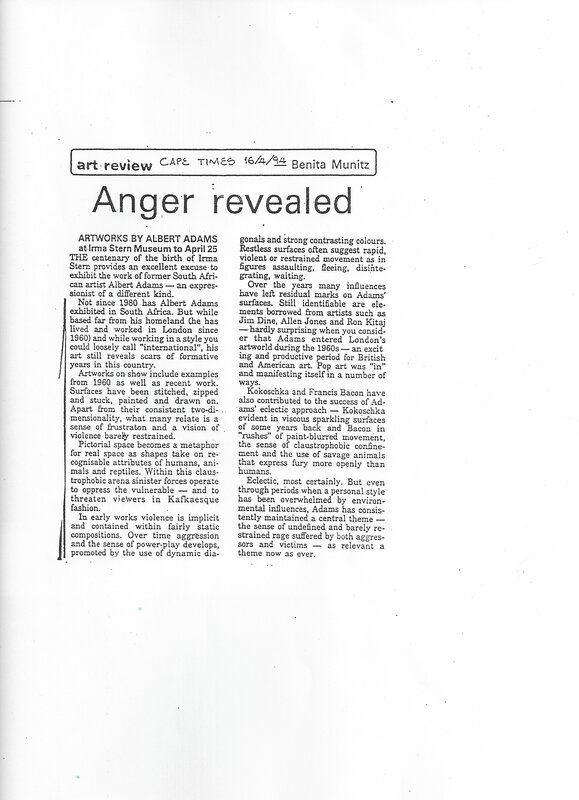 Not since 1980 has Albert Adams exhibited in South Africa. But while based far from his homeland (he has lived and worked in London since 1960) and while working in a style you could loosely call “international”, his art still reveals scars of formative years in this country. Artworks on show include examples from 1960 as well as recent work. Surfaces have been stitched, zipped and stuck, painted and drawn on. Apart from their consistent two-dimensionality, what many relate is a sense of frustration and a vision of violence barely restrained. Pictorial space becomes a metaphor for real space as shapes take on recognisable attributes of humans, animals and reptiles, Within this claustrophobic arena sinister forces operate to oppress the vulnerable – and to threaten viewers in Kafkaesque fashion. In early works violence is implicit and contained within fairly static compositions. Over time aggression and the sense of power-play develops, promoted by the use of dynamic diagonals and strong contrasting colours. Restless surfaces often suggest rapid, violent or restrained movement as in figures assaulting, fleeing, disintegrating, waiting. Over the years many influences have left residual marks on Adams’ surfaces, Still identifiable are elements borrowed from artists such as Jim Dine, Allen Jones and Ron Kitaj — hardly surprising when you consider that Adams entered London’s artworld during the 1960s – an exciting and productive period for British and American art. Pop art was “in” and manifesting itself in a number of ways. Kokoschka and Francis Bacon have also contributed to the success of Adams’ eclectic approach – Kokoschka evident in viscous sparkling surfaces of some years back and Bacon in “rushes” of paint-blurred movement, the sense of claustrophobic confinement and the use of savage animals that express fury more openly than humans. Eclectic, most certainly. But even through periods when a personal style has been overwhelmed by environmental influences, Adams has consistently maintained a central theme -the sense of undefined and barely restrained rage suffered by both aggressors and victims – as relevant a theme now as ever.